“I wonder however if there are studies that compare the method of induction. My Doula said that the increase rates of uterine/ scar rupture was due to using high dosages of Pitocin, but now the induction uses lower dosages and administered at longer intervals. Do you know something about this? 1. Induction protocols can vary by provider, including some providers who don’t induced planned VBACs at all. 2. Induction guidelines can vary by hospital. 3. Women can react to the same drug/dose differently. 4. 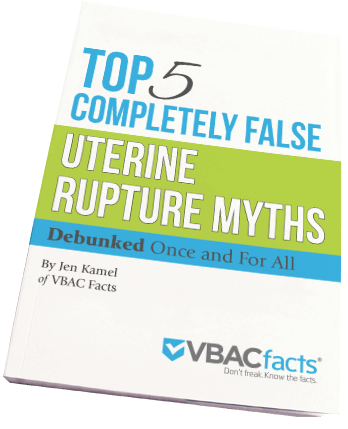 Some studies do compare the uterine rupture rates among spontaneous, induced, and augmented planned VBACs. Medical studies on induction are only relevant to your situation if your provider follows the same protocol outlined in the study. However induction protocols are often not spelled out in detail unless that is the focus of the study. When reading medical research, make special note of the sample size. We need ample participants in order to accurately capture and report the incidence of uncommon events such as uterine rupture. I typically like to see at least 3,000. Also remember that it’s ideal to have a experimental group (who receives the induction protocol) and a control group (who does not receive the induction protocol) in order to measure the difference in outcomes, such as fetal distress, uterine rupture, hemorrhage, cesarean hysterectomy, etc. Ideally, we would have a couple thousand, at least, in the experimental and control group. In terms of the trend that induction now uses lower dosages and is administered at longer intervals, that may be true in some practices, but I would always confirm and not assume. Anecdotally, I have heard a wide range of induction protocols reported just as research has identified similar variations among cesarean and episiotomy rates that are not linked to medical indication. This California Healthcare Foundation infographic clearly illustrates how hospitals differ in this graphic. PS: If you join the VBAC Facts Membership for Professional, you can quickly get up to speed on the research and easily stay current as it is published. What is the induction protocol at your facility? Does it differ for those with a prior cesarean? Let me know in the comment section. Hi Jen, I’m not seeing the infographic referred to in the article. I’m viewing this on my phone, if that helps. Thank you so much for bringing that to my attention. I have added the infographic. I am a nure in a cardiac unit and had to have an emergency cesarean 2 yrs ago. Our policy is you have to go into labor on your own, there is no induction. They also make you sign a waiver (I just looked around on our elctronic forms) that could kind of scare you into another cesarean. I’ve even asked around to some of the L&D nurses I know and all frown upon VBACs The LC there I talked with said she thinks it’s a great idea and worth the try if I wanted. Her daughter has had two vaginal deliveries after her first baby (who was a c-section). So I am doing my personal research too. You might want to contrast the information you received from your nurse colleagues with what ACOG states. ACOG is clear: VBAC is a safe, reasonable, and appropriate option for most women so the fact that those nurses frown upon VBAC is disconcerting for three reasons. First, it’s not consistent with the evidence. ACOG states that women should be counseled about VBAC and candidates should have the opportunity to VBAC. (Note that very few women are truly not candidates per ACOG guidelines.) ACOG is clear that the ultimate decision regarding mode of delivery rests with the patient and that regardless of restrictive VBAC policy, women should not be forced into cesareans. We also have to be cognizant that both VBAC and repeat cesareans carry risk. Few women are actually counseled on how the rate, response, and outcomes of placenta accreta compare with uterine rupture. I write extensively on this subject here. Second, what would it be like to labor with a nurse who is not really supportive? Imagine managing each contraction with nervous energy in the room. Now imagine laboring without it. Third, their perspective likely mirrors the tone of providers and administrators at that facility. You deserve better. Life is easier when we have support. And being supportive of VBAC is consistent with the evidence, ethical obligations, and national guidelines. So, nurses frowning upon VBAC is a huge red flag. If you are interested in VBAC, I encourage you to investigate more supportive options in your community. Also, subscribe to my newsletter and receive a one-hour podcast where I compare and contrast what ACOG says versus what women are told. Also, check out my online workshops for more in-depth information. To continue the conversation, I shared your comment here. A couple nurses have already replied.